Christmas was a dream! Christmas Eve the boys came into our bed early in the morning to snuggle. The joy in both the boys voices brought warmth to my heart. Ethan said in a high pitched tone, "we are a family now". Oh, sweet boy! Christmas Eve night, we quickly tucked the boys into bed, after returning home from a traditional and joyful night filled with a yummy dinner, caroling and the reading of Christ's birth. 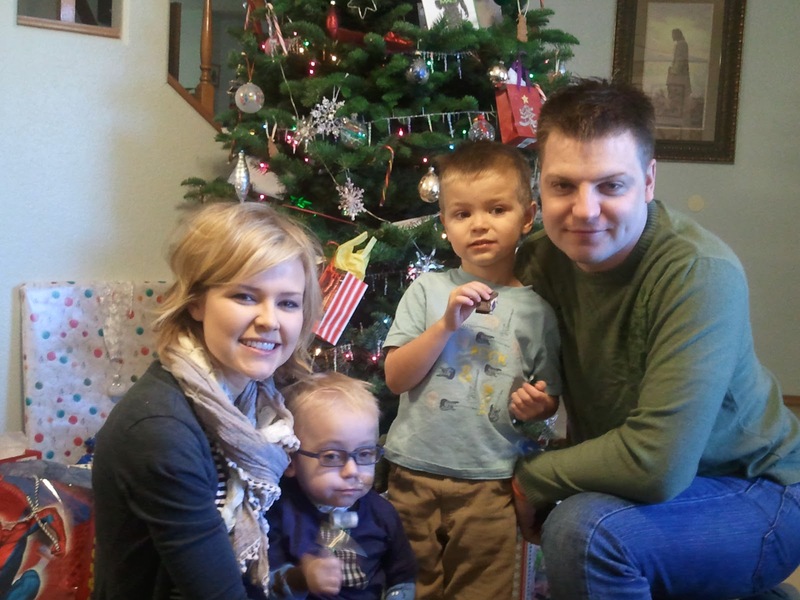 Michael and I reminded the boys that they needed to fall asleep quickly so Santa would have a enough time to come. Ethan made sure to leave out a snack for the Rudolf. 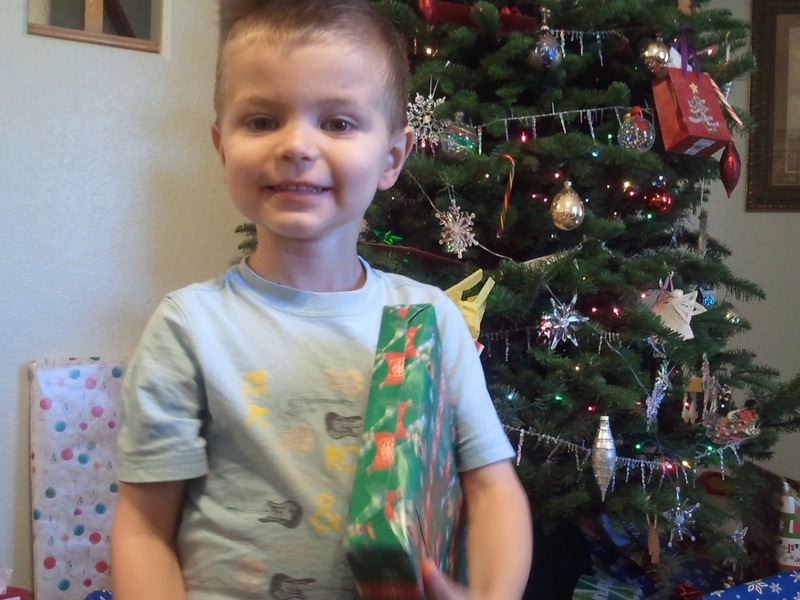 Sunday morning, the boys woke to a Christmas tree trimmed with gifts accompanied by the stockings. They both opened the gift's that were left in the stocking and then we quickly rushed to get into our Sunday best to attend Church. Over the past year Michael and I have not been able to attend church together. Emmett is not able to go out to public events or locations to protect him from catching a virus or infection. My sweet and amazing Mother offered to stay at home with Emmett so Michael, Ethan and I could all attend church together. That was a nice gift. The music was beautiful and I could feel the love and warmth of the Holy Spirit strongly. After church we returned to open gifts and watch our boys eyes fill with excitement and joy. I LOVE Christmas. Michael then ventured off with Ethan to his side of the family, Christmas dinner. Emmett and I stayed home and snuggled reading books and exploring his new trucks and lego's. Emmett is such a joy to be around. The Trach has enabled him to breath with much more ease. He does not require any more oxygen support. Which releave's a large portion of my anxiety and stress. He run's around the house like any other two year old. He is exploring the world around him by digging in the rocks, wrestling with his brother, teasing and interactning playfully with others. 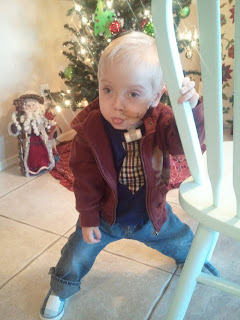 This is the Emmett I new before his accident a year ago. Our God is good! Emmett is on a ventilator at night. This is used to allow his body to be able to fully rest at night. The ventilator will also help his lungs to expand like they should. This will enable them to grow. Emmett is already gaining weight. His face is filling out and when I scoop him up to give him "loves" I can feel the difference in his body weight. Ethan is my special helper. We walk a thin line and try to be cautious, as you could imagine, Ethan fight for attention. This is a battle that I know many mom's can relate too. It tears my heart to thinkg of all that Ethan has been through this past year and more. He is a super trooper and I am so proud of how much he has bravely endured. Family and friends have been terrific in helping him feel loved and special too. We will forever be thankful for those special angel's in our lives who helped make our Christmas possible in so many way's. I hope they feel and know our deepest gratitude we send and feel towards them. Thank you! Thank you all for the faith and prayer's in Emmett and our families behalf. We all witnessed a Christmas miracle. Thank you everyone for praying for Emmett and for his Surgeon. The surgery went real well. Michael and I were informed that it may take a while for Emmett to get used to breathing through the Trach and he would need an attachment called a Passy Muir to be able to learn how to speak. After an hour and a half post surgery, Emmett was up and playing and speaking with out the attachment. Amazing! Today he did not require oxygen support which he relied on to breath the past 6 months. He has beautiful pink cheeks and for the first time since Emmett's accident a year ago, his chest and neck do not retracted when he breathes. He is one happy camper so far. I know it will not be all bliss... I am just grateful for a good start. This was a very difficult decision to make. We are so grateful for the guidance of our loving Father in Heaven who helped us make this decision. We are so grateful for all of the faith and prayers that were sent to help Emmett and our family. We have been so blessed. It was what Emmett needed. I loved reading all of the comment's from all the pro Trach parent's. Thank you for your kind words and positive attitudes. We know a beautiful little girl who had a Trach. She was Emmett's pal in the NICU. She and he family have always been an inspiration to our family. Her Trach is out now! It is amazing how resilient children are. Having a child with a Trach, we are learning, comes with lot's of training. Emmett will be on a Trach ventilator at night. This will require him to have nursing care every night at home. We are learning how to suction properly, along with taking a CPR and Trach CPR classes. Emmett will be in the hospital for a minimal of 9 more days. We HOPE to be home for Christmas. We are not certain of this yet, day by day. Here is a video of Emmett 2 1/2 hours post surgery. Enjoy! Today was a scary day! Thursday evening Emmett had a low grade fever. He has 6 teeth coming in right now. The fever persisted through the night into the morning. It did not increase in temperature and he was still his playful self. I layed him down for a nap. He had NO increase work of breathing and his oxygen level's were at there norm. About 2 hours later I heard Emmett coughing and his alarm to his pulse oxymeter sound. I went into find him burning up with a fever and struggling to breath. After watching him closely for a few minute's I decided I needed to call 911. Thankfully my wonderful friend and neighbor Jen was visiting. She held Emmett while I gathered Emmett's bag for the hospital. She then cared for Ethan until my mom was able to pick him up. We were ambulanced to Banner Thunderbird Hospital, which is much closer to our home. The Paramedic's wanted to have him stablized before making the 40min journey to Phoenix Children's Hospital. The Medical Staff at Banner Thunderbird were wonderful. He was given a few breathing treatments and his temperature was taken with the result of 106.0 degrees! The Medical staff immediately called for a helicopter to take us to Phoenix Children's. When landing on the roof top of PCH, I felt a sense of comfort knowing we were at a hospital who know's Emmett. The Doctor's believe he aspirated his own secreations again, resulting in pneumonia. He also some how caught a stran of Para Influenza, a virus that can result in Croup. Croup to Emmett would be life threatening because of his restricted and complicated Trachea. I am so thankful to our Father in Heaven who is watching out for Emmett and helping us to get to the hospital at a timely matter. I am thankful for the wonderful people who we have been blessed to help our boy. Emmett is currently on antibiotic's among other medications to help treat the illnesses. Ethan walked into the living room to find 8 Paramedic's working on his little brother. Ethan has seen a lot for a 4 year old. I sat on the stretcher with Emmett in my arms. The look in Ethan's eyes made my heart ache. I told him that Emmett would be okay and that he was going to stay with Miss Jen (our neighbor). He was trying so hard to be brave as his lip quivered and he nodded his head to say "okay momma". He was trying to be so brave as he waved good bye to us. Oh Ethan thank you for being so brave and strong! I love my boys! Thank you all for praying for my boys. Thank you for all of your support through this rough time. We are so blessed to have so many people pulling for us and Emmett. Here is a video of Emmett being air vacced to PCH.